Green beans and Brussels sprouts always seem to be getting all the love when it comes to holiday side dishes — but we’re here to state the case that asparagus has been seriously overlooked when it comes to Thanksgiving and any other winter feast. 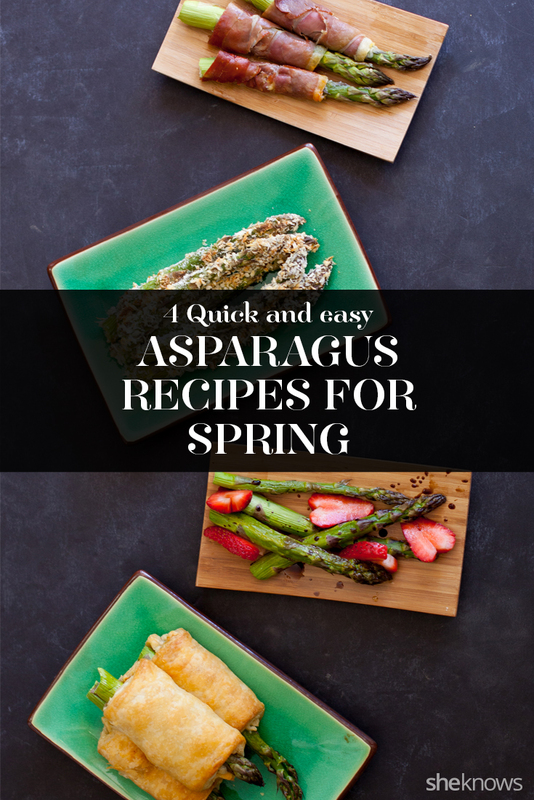 Seriously, though, try crispy asparagus fries, gooey prosciutto-wrapped asparagus stuffed with blue cheese, colorful balsamic asparagus and strawberries or flaky asparagus pizza pockets at your table this year. Any of these delicious dishes work just as well as an easy appetizer too. The best part? Each recipe is ready in under 30 minutes. 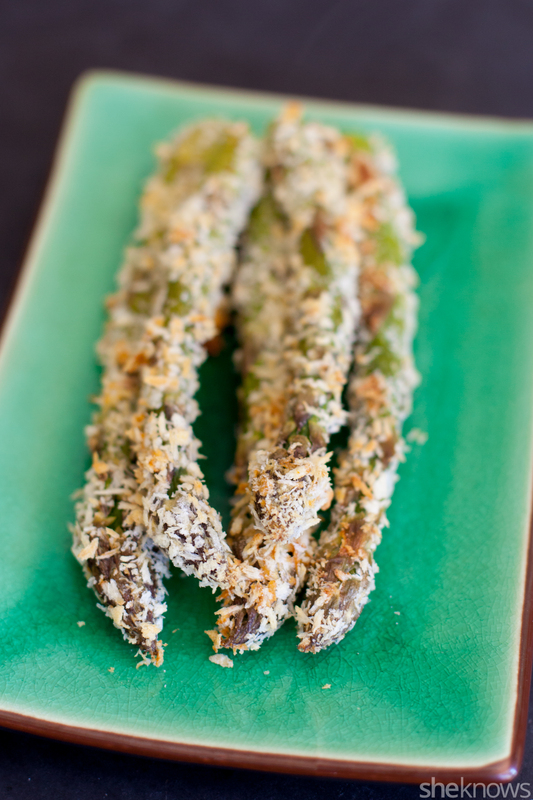 These crispy, breaded asparagus spears are baked in the oven instead of fried. But I doubt your family will even notice how healthy these are as they devour them. Trim the ends from your asparagus spears. In a shallow bowl, mix the flour, salt and pepper. In another shallow bowl, whisk the eggs. In a third shallow bowl, place the panko. Dip each asparagus spear into the flour, then the eggs, then the panko. Make sure each one is well coated. Place the breaded asparagus on a foil-lined baking sheet, and spray lightly with oil. This side dish is salty and gooey and absolutely addicting. If the combination of blue cheese and prosciutto is just too salty for you, then try a less salty cheese, like chèvre. 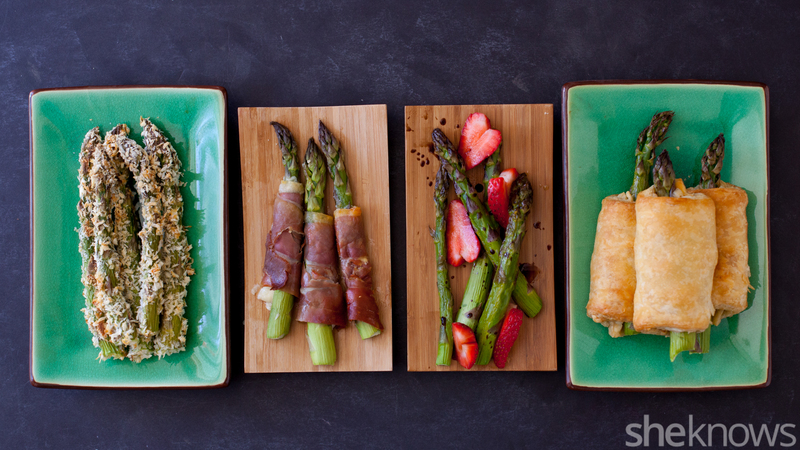 Place a prosciutto slice with a piece of asparagus at 1 end on a foil-lined baking sheet. 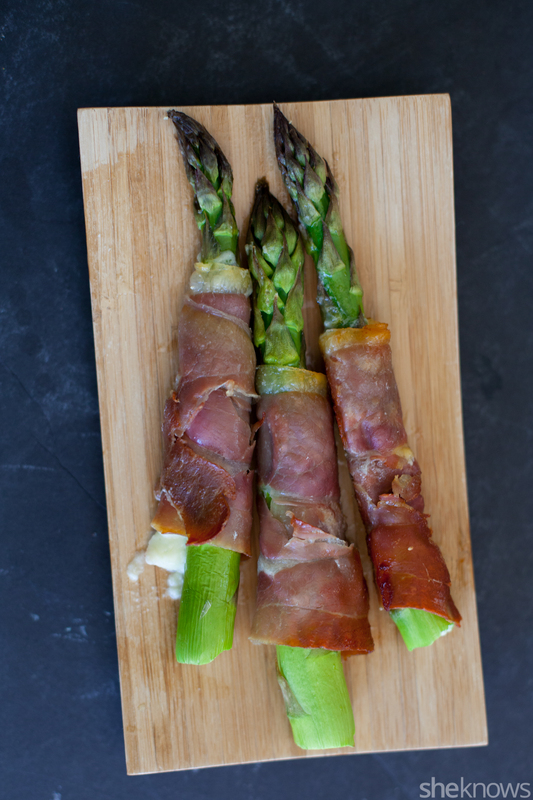 Put a few crumbles of cheese next to the asparagus, and roll it all up in the prosciutto. Repeat with the remaining asparagus. Bake for 10 minutes, until the prosciutto is crispy. This cute asparagus dish is bright and cheerful, both from its stunning colors and the tangy combination of balsamic vinegar and strawberries. If you don’t have a good-quality finishing vinegar, just boil your balsamic vinegar until reduced by half before drizzling it on the dish. Rinse your strawberries, remove the stems (I like to cut them out in a “V” to make a heart shape), and then slice the strawberries. Place the asparagus on a foil-lined baking sheet, and drizzle with olive oil. Bake for about 10 minutes, until tender but still crisp. 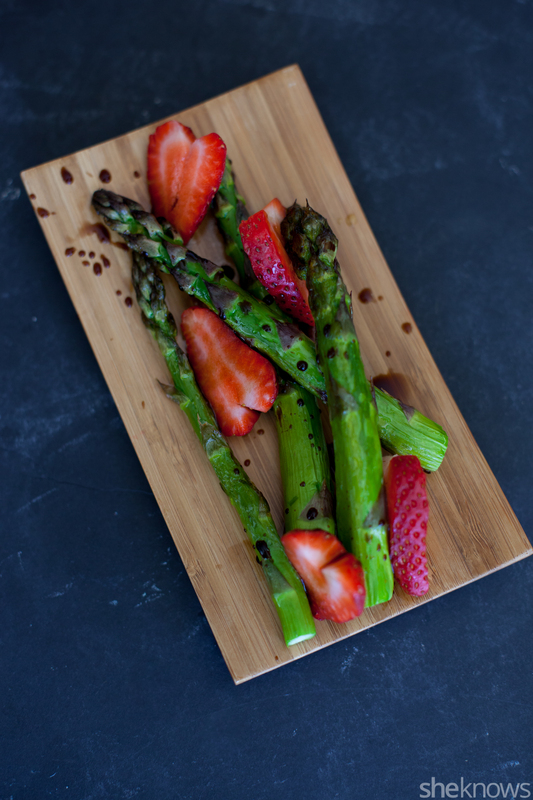 Plate the asparagus with sliced strawberries, and drizzle with the vinegar. 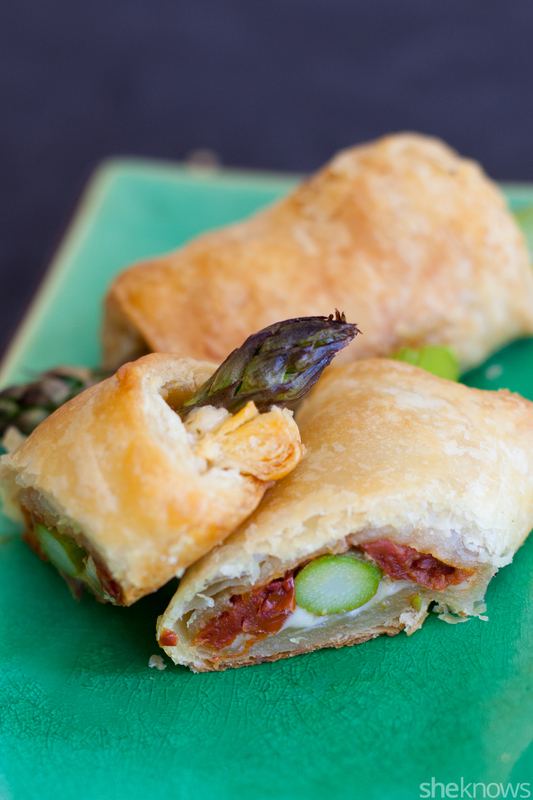 Puff pastry stuffed with sun-dried tomatoes and mozzarella gives a buttery, flaky crust to this asparagus side dish. If you’re looking for a healthier option, swap the puff pastry with whole-wheat pizza dough. Thaw the puff pastry according to the package directions, and cut each sheet into 6 equal pieces. Spread some sun-dried tomatoes down the center of each piece of puff pastry. Place a piece of asparagus on top of the sun-dried tomato, and sprinkle with cheese. Fold the ends of the puff pastry over each other, and place each pocket seam side down. Bake for about 20 minutes, until puffy and golden. Originally published April 2015. Updated October 2017.